Not only one sculptural wonder by Danish architect Bjarke Ingels, this summer Serpentine Gallery brings along four experimental designs to London’s Kensington Gardens. The show which opened to the public over the weekend is the last one by long-term director Dame Julia Peyton-Jones, encapsulating her drive and vision. The Summer Pavilion concept is an opportunity for the chosen architect to experiment with forms in one of the most prestigious parks in central London. 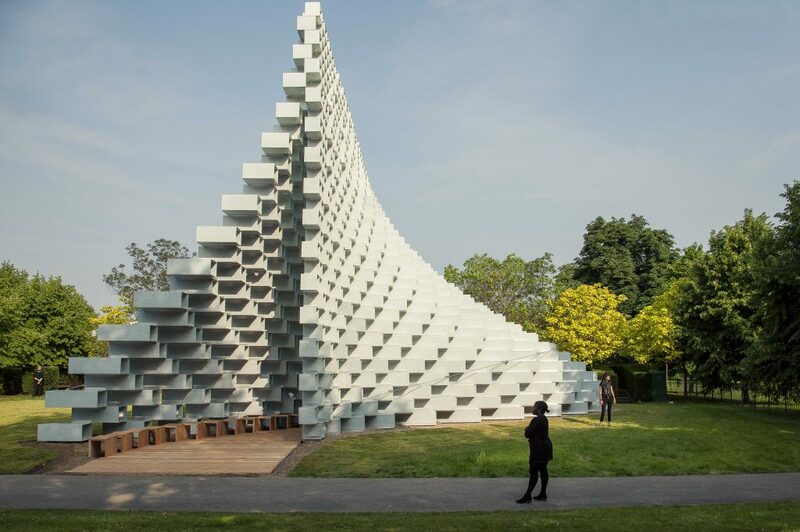 This year Bjarke Ingels – described by Serpentine director Hans Ulrich Obrist as ‘the first architect disconnected completely from angst’ – has made the most of the Pavilion commission, playing with scale and materials. Despite the short timeframe to complete such a project, you can see the clarity and enthusiasm in Ingels’ approach. With his firm BIG he spent exactly six months (to the minute by midnight of the launch) to complete the Pavilion. At the preview morning the last set of fibre glass blocks were still waiting to be lifted to the very top. There is a sense of lightness and ease in BIG’s carefully considered concept, titled ‘Unzipped Wall’. “It was a very fast process,” project leader Maria Sole Bravo explains “we made massing studies, working with volumes, and then presented twenty or thirty models”. The team also explored previous Summer Pavilion designs, and you can sense a kind of genealogy between Gehry’s deconstructed form with heavy Douglas Fir and Fujimoto’s light orthogonal grid. Although very different and unique, BIG’s design resonates beautifully with the history of the Pavilion concept. “It’s a gate and a wall” Ingels describes it “You could also climb the entire slope, but Royal Parks regulations created a limit”. For an architect known to combine ski slopes with apartment blocks, that must have been a let-down. Ingels is the leading star architect of the young Scandinavian generation and his firm believes in a collaborative working culture. Most big companies work with a more hierarchical system: “Traditionally it’s the main architect who comes with the idea” says Sole Bravo, who has worked with Bjarke Ingels for ten years. Thomas Christoffersen, who works at the Copenhagen office and was also present at the Serpentine launch, says that it’s a Scandinavian working ethos and they are always looking for concepts where they can expand the public/private boundaries. BIG’s ideas do not rely on heavy, hard-to-digest theorising. Instead Ingels has published his main philosophy in a comic book format and keeps an astute eye on how things are evolving to seize the opportunities. ”Future is already here” Ingels says, clearly relishing the moment in London, which places him alongside the most renown practitioners of previous generations, including his former boss Rem Koolhaas. Ingels mentions Danish architect Jörn Utzon as one of his heroes and an inspiration for the Pavilion design. “Creating difference out of repetition,” Ingels explains “it’s that spirit we tried to bring here”. BIG has used the fibreglass manufactured by Fibreline in shelving previously. Here for the first time it’s used as a structural material. Like a giant shelving system, which can be taken apart and reassembled, the Pavilion exemplifies the Lego ethos to ‘play well’ – another Danish super-brand. 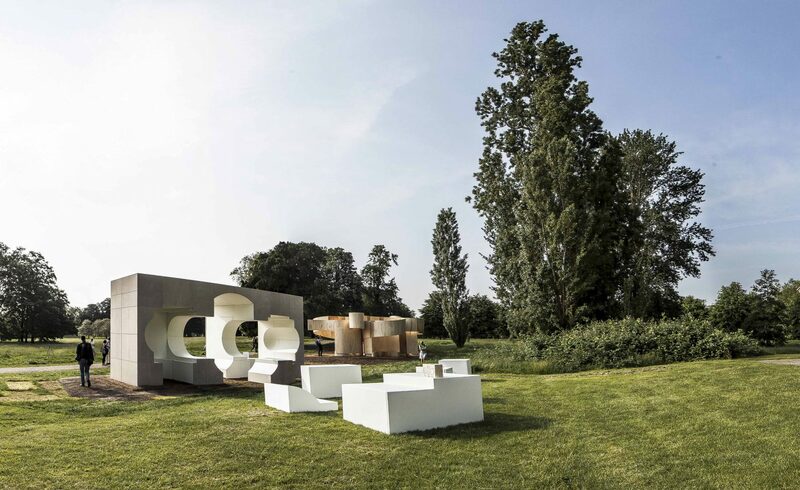 Serpentine’s architecture programme this summer extends to further experiments with mini-pavilions, named ‘Summer Houses’, a short walk away by Queen Caroline’s Temple. Serpentine directors Peyton-Jones (who will step down after the Summer Party) and Obrist invited four architects to respond to the Temple’s neo-classical form, which Nigerian-born Kunlé Adeyemi first described as “a daunting task”. He became fascinated by it however and created a kind of post-modern reversal of the Temple’s form in sandstone, which invites people to physically feel and use the smooth interior upholstered in slick cream white. London- based Asif Khan made historical studies and responded to lighting conditions with a tall, slim fence-like structure. Yona Friedman’s improvised design, made of thin steel circles is even more ephemeral, a reminder that “architects are sculptors of the void” as Friedman pointed out. Frank Barkow, from Berlin-based Barkow Leibinger studio, exhibits a curved plywood structure, highlighting the experimental aspect of this particular show, “the luxury to think and work like this”. His design takes the form of a giant sketch, a project which Barkow describes as “a prototype that will have another life”. Hans Ulrich Obrist noted that it was Zaha Hadid who had instilled “a desire to experiment” in the Serpentine Gallery’s architecture programme, to which she designed the very first Pavilion in 2000. Bjarke Ingels Group for sure is following that brief. This year the exhibition is supported by Goldman Sachs and the launch coincided with the opening of BIG’s first London office.